I would add to that definition this: comfort foods, at least my comfort foods, are all warming. They are the equivalent of food hugs. And although not all my comfort foods are associated with childhood or even home cooking, they do share one trait: they are all tinged with nostalgia. Many of them are foods from Japan that I can no longer get easily, like udon – a bowl of which I always indulge in whenever I have a stopover in Tokyo, even if it’s in the middle of the night. Of course the strongest nostalgia, and the warmest hugs, come from childhood foods – but often those are out of step with how we like to eat. Shepherds’ pie (a.k.a. pâté chinois in my family, and junk in Bonnie Lee’s) is one of those foods. Meat doesn’t cross our threshold very often – and when it does, it is for an indulgence, like our recent Thanksgiving meal – so Shepherd’s pie has been off the menu for a very long time. For day-to-day meals, we like to eat a little further down the food chain. That’s why I was really happy to see this recipe for vegan shepherdess pie on Kellie’s Food to Glow (and endless source of food inspiration). I was on a trip when I saw it, and I knew it was something I’d be trying when I got home – and I did. It didn’t disappoint, either. The blend of umami and mashed potato, the textures, and the warmth led to a perfectly nostalgic moment, and the grown-up touches that my childhood palate might have missed (like the celery root in the mashed potato) added just enough of a twist to make it interesting. So, I’m curious. What are your comfort foods? Have you adapted any of them to be more sustainable? 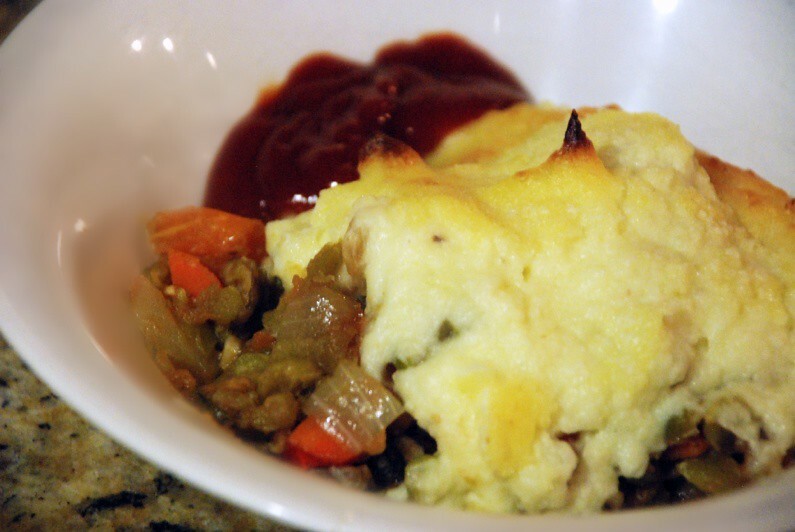 This entry was posted in Waste less recipes and tagged comfort food, food, green, green living, junk, lentil, pate chinois, recipe, shepherd's pie, sustainability, sustainable living, vegan, vegetarian by Jean-François. Bookmark the permalink. I agree with your assessment of what is comfort food. It really is so much more than the’ down home’ fare. Meatloaf is one I think. My mother was not a good cook at all, so I can not say we had fond memories of her dishes. Many of our meals were from restaurants, not especially known for comfort food. But I love to cook and like my meatloaf, many soups became our comfort food. As for adapting them to sustainability, soups are that by nature. Anything can become a soup. Also, I make a huge pot and freeze it, so it lasts. Less energy to cook in quantity and less often too. Soups are high on my list too. Good winter fare – and great way to use up just about anything in the fridge. I particularly like ones with a spicy kick, like the vegetable tom yum soup I just had for dinner. I don’t eat meat every day and haven’t had red meat for over a decade. My comfort food though seems to revolve around meat — mashed potatoes and gravy, preferably with my fried chicken gravy. But, I’ve been known to make a simple cream based white sauce for my vegetarian sister in law. I also have been hurting for batter-fried halibut nuggets like they served all over Ketchikan, AK when I lived there. Sigh. Batter-fried tofu anyone? Mmm, fish ‘n chips. That makes my comfort food cut – and you sent me on a web search looking for a more sustainable (and kind) alternative. A lot of people use tofu, and nice though that may be, it seems to lack something fundamentally fish ‘n chippy. One recipe I found called for halloumi (a brined cheese that doesn’t melt easily, which I’ve been meaning to try). Think I’ll be seeking that out when I get back to L.A. for Xmas. Will have to try the white sauce idea with mashed potatoes too (mashed potatoes ‘n gravy are also high on my list – many of my comfort foods have and ‘n). Think I’ll start with a nice dark roux, so I can get nice nutty tones and a bit of color into the faux gravy. Mac ‘n Cheese. Another worthy comfort food with an ‘n. And yet Kibbles ‘n Bits, not so much – despite the ‘n and those chewy bits. Comfort food is a food hug indeed! But I think comfort food can be healthy too – my comfort food is my Mom’s spaghetti sauce and her chicken soup, which are fairly healthy (especially since I now use spaghetti squash instead of pasta). And of course, my ultimate comfort food is yaki imo, but the carbs in sweet potatoes are probably some of the best carbs to eat for your body & emotions. I love variations on Shepherd’s pie too! There’s a chance we’ll be visiting Japan this winter, and if we do, I’ll be on the lookout for a yaki imo man. Amazing how satisfying that simple dish is – and, yes, healthy. Anything curry and chilies, or coconut and sago. Strangely, nothing from my childhood, which was all meat and taters and bacon-on-this-and-that and mac-n-cheese from the box. It wasn’t until I was in Malaysia for two years — getting used to a new culture, being newly married without any friends or family — and then coming BACK that I realized what comfort foods really meant. When I was there, it was Oreo’s and bacon. Since then, 15 years later, it’s Asian food. Purely magical and warm. PS — I sauteed bok choy that I picked on Friday with tofu in sesame oil and soy sauce…for BREAKFAST. Just a great way to start my day! Curry, chilies and coconut get my vote too – especially when I have a cold. There’s something about a good curry burn on a sore throat that hurts in a good way. Bonnie Lee and I were just talking about all the foods we miss from Japan a couple of nights ago – like onigiri, inari zushi, and tonyu nabe. They were all the opposite of spicy, but it’s food we discovered together at a time when our senses were heightened by the knowledge that we wouldn’t be in Japan forever, and just had to take in as much as we could while we could. Think those foods are as much about a time and place and experience as they are about flavours (though the flavours certainly rock).